36 pre-generated duellists, MONDOs, troopers, bikers and dregs for your GURPS Autoduel campaign. A selection of 100-point characters make "instant" player characters, and busy GMs will delight in the variety of non-player characters. 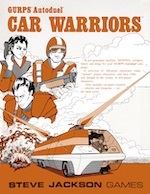 Also includes cut-apart counters – vehicles and obstacles – on the back cover. GURPS Autoduel – A post-apocalyptic world devastated by war, famine and despair . . . with lawless highways where the right of way goes to the biggest guns.